The second annual ADAPT Leadership Awards Gala were held on Thursday, March 14th at Cipriani 42nd Street benefitting ADAPT Community Network which provides programs and services for children and adults living with disabilities throughout New York City. 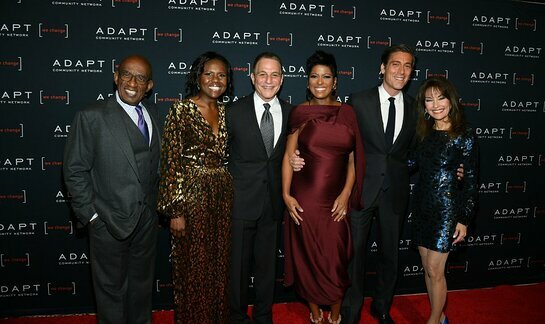 This year’s ADAPT Leadership Award honorees were: David Muir, Anchor and Managing Editor of ABC World News Tonight with David Muir and Co‐Anchor of ABC’s 20/20; Tamron Hall , Journalist, TV host, and philanthropist; John and Mark X. Cronin, Founders of John’s Crazy Socks; Peter M. Meyer, Market President New York City for TD Bank; and Actor Tony Danza, who was presented with the Hausman Humanitarian Award recognizing exceptional humanitarian contributions that give back to the community. Cara Buono, co-star of the hit Netflix series Stranger Things, and Emmy-nominee for her role on Mad Men, was the event’s host. The Honorary Gala Chairs for the evening were Al Roker, co‐host and weatherman of NBC’s Today Show, and Deborah Roberts, ABC News correspondent for 20/20, Nightline, Good Morning America, and ABC World News Tonight with David Muir. Honorary Gala Co‐Chairs were Susan Lucci, Emmy‐winning actress, New York Times best-selling author, entrepreneur, and past ADAPT honoree and host; Tamsen Fadal, 11‐time Emmy‐winning anchor of PIX 11 News, past ADAPT host, and Honorary Vice Chair of the ADAPT Board of Directors; and Mike Woods, meteorologist and reporter for FOX 5’s Good Day New York, and past ADAPT host. Gala Co‐Chairs were: Edward R. Matthews, CEO of ADAPT Community Network; Marty & Helaine Hausman, whose family helped found United Cerebral Palsy of NYC; Marissa Shorenstein, President, Northeast, AT&T; and Alan Zack. Al Roker presented the first award of the evening to Tamron Hall. Deborah Roberts presented the award to David Muir. Blue Bloods star Abigail Hawk presented to Peter M. Meyer. Tamsen Fadal presented to John and Mark Cronin. Susan Lucci and James Hausman presented the final award of the evening to Tony Danza. Edward R. Matthews, CEO of ADAPT Community Network and Gala Co-Chair, and Tamsen Fadal, Vice Chair of the Board of Directors of ADAPT and Gala Co-Chair, gave closing remarks.